A type of confection prepared with sugar, corn syrup, peanuts, and butter that has the flavor of buttery, caramelized sugar surrounding a flat layer of peanuts. The candy is quite hard and brittle, hence the name; a result of cooking a sugar syrup with moderate heat until the syrup reaches 300ºF (hard crack stage). Once the syrup reaches the required temperature, it is removed from the heat. Butter and peanuts are added, and the mixture is spread quickly into a thin layer on a baking sheet. When the candy has cooled completely, it is broken into pieces and stored in an airtight container that is usually lined with waxed paper. 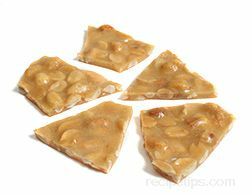 Peanut brittle is a popular candy in the United States and other countries of the Western world. The consumption of peanut brittle is usually associated with holidays, such as Thanksgiving and Christmas, but it has become so popular that it is now served year round. There are many brands of commercially produced peanut brittle found in most large food stores.